Front left 3/4 view. The elevators are mounted on large delta wings. Rear cargo ramp open. There’s a grappling hook at the front to hold any loads in place. The whole update process took around an hour and 20 minutes to complete. Here, I thought it would be super easy to install the Windows 10 Creators Update (1703) which released in April (I have Defer Feature Upgrades turned on). Should run just like a regular update right? Not so much for me. The previous Friday is when the update first tried to install, getting nowhere past 0% then my computer seemingly locking up. Reboot, revert changes, back to normal. Try it again, same result. Fast forward a week to the 1st, Windows is redownloading the update, while it’s doing that, I’m researching reasons why the update will fail. Most blogs and tech sites show error codes and the like, but since I never got to an error code I thought I was out of luck. I checked the Ecent Viewer for clues and found an error relating to the volume manager crashing, around the time the update was running. I was thinking this may have been from my forcing a shut down when the computer locked up, but further investigation revealed that the system partition was too small. 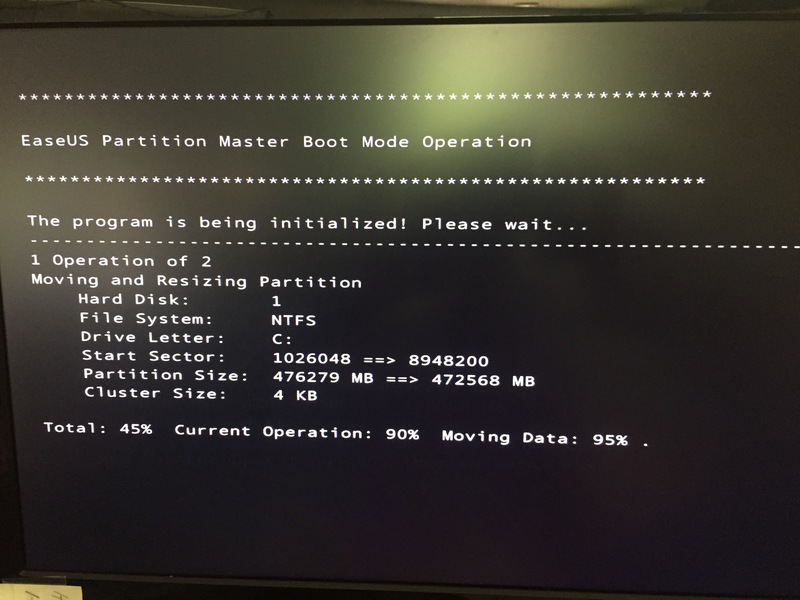 So I went on a partition enlargement adventure with EaseUS Partition Master. I shrunk the C: drive a little bit, ~3GB, then moved the freed space to the beginning where the system partition is, then used the free space at the beginning of the disk to expand the system partition. Needless to say, if the system locked up at this stage, I would’ve needed to use that backup taken just 30 minutes or so before. Once the partition move and merge was complete, the system rebooted once more and then began running the update. Lo and behold, it started chugging then kept on chugging. The whole update process took around an hour and 20 minutes to complete. A few weeks ago I purchased an OurWeather kit from SwitchDoc Labs to turn into a place anywhere weather station. Never got around to setting it up for testing, until a couple days before Hurricane Matthew arrived. I was able to update the firmware and connect to the station to the Weather Underground Personal Weather Station Network. Notes: Wind vane was not calibrated to north, AM2315 (temp/humidity) sensor is not weatherproof and was intermittent due to water intrusion, pressure sensor intermittent due to voltage spike. The following are pictures of the set up. Having looked into the various ways of home automation, I finally settled on WeMo to start with. Instead of having smart bulbs, I just want to put in smart switches, for now. I have installed 1 WeMo so far, and it’s pretty legit to say the least. I may get some Phillips HUE lights as well and integrate the HUE Hub with the Home Remote layout. I also found Home Remote to control many automation devices. This is cross-platform control software, you design your own layout with the designer and upload it to your device. Below is a tour of my first layout. Drogue’s deployed and starting air brakes. Mission success. Only lost two batteries.